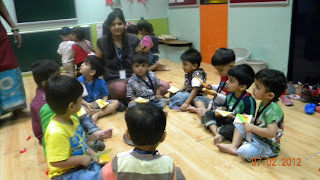 On 7th February 2012, the Playgroup section celebrated 'Sunshine Day'. To make this topic more interesting, a cooking activity was conducted with the children. Children were taught to make sunshine sandwiches. 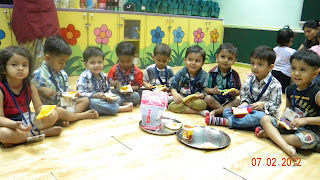 This activity not only taught them simple cooking, but also helped in the enhancement of the concept. They were given mango jam to be applied on the slice of bread. Children just enjoyed this yummy sandwich. They were glad and loved this simple cooking experience.